In the pantheon of situations to avoid when cruising, northers in the Gulf Stream are up towards the top. The wind opposing current kicks up a nasty, short seaway, and the warm water mixing with the cool air from the north increases gusts. In the following video you will see some fascinating camera angles, the result of taking a GoPro camera and lashing it to a boat hook. FPB 78-1 is very light, she has just 2200 gallons/8300 liters of liquid in her tanks. The height and length of the FPB 78 require that the hull ride softly with slow pitch and roll motion. This shaping makes the boat very efficient at slower speeds, while limiting top speed potential. The other side of this coin is the comfortable ride achieved, which is difficult to illustrate. 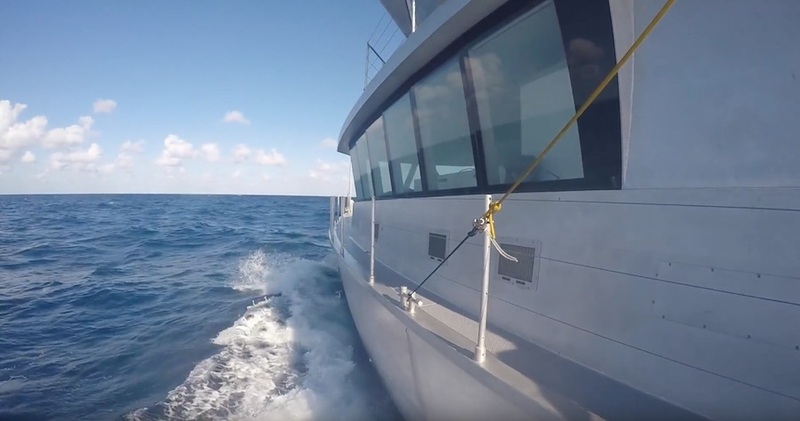 This video will give you a sense of how much FPB 78 hulls react to waves and wind gusts. This entry was posted on Saturday, December 3rd, 2016 at 6:03 am and is filed under Dashew Logs, FPB 78, FPB 78 Videos, The Logs. Both comments and pings are currently closed.